Bill Hook was a full back and occasional centre who made 129 appearances for Gloucester between 1938 and 1952. He was first choice for Gloucestershire, playing in the 1948-49 County Championship final. He also played for Western Counties against the 1951-52 Springboks and was capped three times by England. William Gordon “Bill” Hook was born in Gloucester on 21 December 1920. 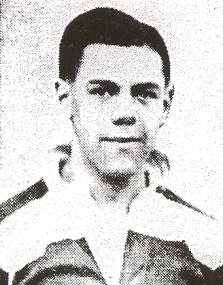 He was the younger brother by ten years of the Gloucester and Gloucestershire winger Bob Hook who made 146 appearances for the club in the thirties. Bill supported Gloucester from an early age and grew up with the club and with Kingsholm as a part of his life. He told stories of the great players of the twenties that he saw as a small boy and of being smuggled into the Gloucester ground by Jack Stephens, who played full back and outside half for Gloucester and later played Rugby League for Oldham. Bill was educated at Sir Thomas Rich’s School and made his debut for Gloucester at Kingsholm in 1938 aged just 17. Unlike all his contemporaries, he had never played for a local junior club, although he had played a couple of games at Kingsholm for Gloucestershire Schoolboys. He told the story of his first away match for the club at Bristol in September 1938 when the legendary “Bumps” Carpenter took him under his wing, introducing him to the Bristol dressing room with the words “This is the babby we’ve brought down. He’ll take anything fair and square but you drop him anything below the line and I’ll be looking for you” Then, beckoning to the youngster, “Come on me babby, you’ll be alright, now”. Gloucester won 6-0, Bill’s brother Bob scoring the two unconverted tries. Bill served as an aircraftsman in the RAF during WWII, stationed for part of the war in Ghana and Sierra Leone. Despite the precocious start to his rugby career he only established himself as the regular 1st XV full back at Gloucester during the 1946-47 season after Harold Boughton’s retirement. The following season Bill Hook played in 34 of Gloucester’s 40 games and made his debut for Gloucestershire. He became first choice full back for his club and his county and started to attract the interest of the national selectors. 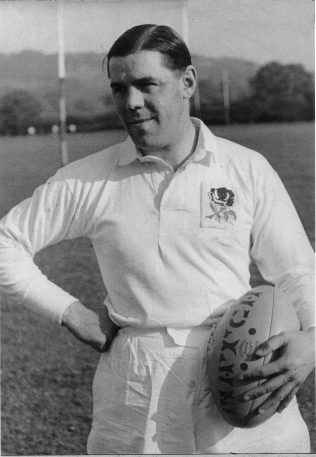 Bill only played 13 games for Gloucester in 1948-49, but although missing part of the season through injury, played in all three England trials. He played for England against The Rest in the final trial and was unlucky to miss selection. He also played for Gloucestershire throughout the County Championship season, which culminated in a replayed semi-final victory over Middlesex at Kingsholm and a 9-3 defeat by Lancashire in the final at Blundellsands. The following season he was again selected for the final trial but fractured a shoulder blade and was unable to play, the injury keeping him out of the game for three months. Not always first choice for Gloucester in 1950-51, it looked as if his chance of England selection might be over. The county kept faith with him however and after a successful county campaign in which Gloucestershire again reached the semi-final, he was chosen to make his England debut against Scotland at Twickenham on March 17 1951. The Times said rather sceptically “Hook as a full back has a long and decidedly chequered career, largely through injuries and occasional loss of form.” However reporting on England’s 5-3 win they changed their tune: “the kind of full back we had hoped him to be, while his catching and fielding of the wet and heavy ball exceeded expectations”. 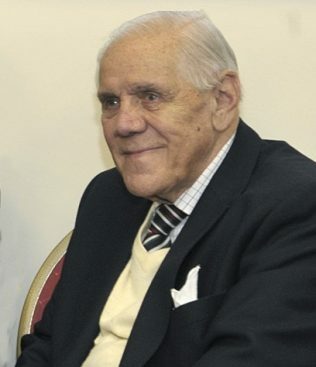 He went into 1951-52, his final season, as England full back and played for both WesternCounties and England against the touring Springboks. He went on to play for England against Wales. He was unlucky to be chosen for England at the end of his career when he was perhaps past his best, although the length of his kicking and coolness under pressure coupled with his keen positional sense more than compensated for his lack of pace. Bill liked to tell a couple of anecdotes about the temptations open to an amateur rugby player. He hated lemons and so instead of sucking the half time slice he took a bar of chocolate onto the pitch to share with a couple of his mates. Eventually the manufacturers found out and as he was by now an England international he was offered a lifetime supply of chocolate if they could put his picture on their wrappers! The other story concerns an end of season tour to Devon. England international Bill Hook’s presence in the Gloucester team had been widely advertised locally but the tour committee were planning to rest him for the final game against Teignmouth. A local department store owner and senior committee man at Teignmouth RFC took Bill to one side and miraculously produced a dozen pairs of nylon stockings as a gift for Bill’s wife. They were like gold dust in the early fifties. “What choice had I but to play?” asked Bill with a grin, keeping four pairs for his wife and distributing the rest around the team. Throughout his long life Bill Hook’s keen sense of humour and remarkable recall of past events never deserted him. He died on May 9 2013 and will be greatly missed. I was born in 1931 and, like Bill, am a ‘Tommies’ old boy. In my day at the school soccer was played at junior level and rugby from about 14 years old. After he retired from the first class game Bill played for a while for the Gloucester Students Union side and I can boast I played with him. He was also an outstanding cricketer and made batting look so easy. Again I had the pleasure of playing in the same team as Bill – the long defunct Gloucester Nondescripts that also had the young Brian ‘Bomber’ Wells before he joined the County CC. My father, Ron James, played for Gloucester in the 1920’s until injury ended his career. He told many a tale of the characters in the Gloucester team in those days – Father Dix, Bumps Carpenter et al. He was also on the Gloucester RFC committee for many years after the war. Bill is the nicest person you could ever wish to meet. Although I follow football he is the “King” of Gloucester Rugby. I agree, Sam – Bill is a real gentleman. Re previous posting, I really must be getting old. It was Don Meadows, another Red & White stalwart who ran the fruit market on the lower Westgate who gave me the half crown. There must have been something in the water in that area because both Peter Ford and Hal Bagwell also lived on St Mary’s Street within a few yards from each other, Sorry about that ! I was born and brought up in the “West End” and Bill’s dad was our postman, he lived on Priory Road in those years. I was born in 1933 so will soon be 80. I went to the Tommies, as Bill did before me, and I captained the Old Richians for a few years. We practised and played at Plock Court in those days, Bill would come out and watch. Will always remember that when I graduated from the Tommies in 1949, he shook my hand and gave me half a crown in his fruit store down Westgate St. I was born in 1934 and as a child often visited Kingsholm with my father. Bill Hook was in his prime and his name is the only one I remember and his photograph brings back special memories. My father, Frank Lionel Sturge (1902 – 1976) played for Glos. Old Boys and I believe had a couple of County games. I have a photograph of the Glos. Old Boys team 1923/24. As “the Tommies” was a soccer-playing school until 1946, I have often wondered how and where Bill Hook gained the skill and experience to make his debut for Glaws in 1938. If anyone else wonders about this – take a listen to Part 4 of our interview with Bill. Mike’s query has been answered via e-mail. Harold, my grandad was Jack Harris, who owned the sports shop on the Bristol Road, just past the old Morelands Match Factory. I believe that Billy Hook was a relative, but any help you can provide in this respect, would be appreciated. Regards. Mike65nK Tanner. Hook was very left footed but developed a remarkable touch kick on his ‘wrong’ touch line. He would kick long slightly in-field and as the pace went from the ball, it would fade at right angles into touch. Dennis Ibbotson told me that, when young, Hook spent hours by himself on Plock Court perfecting it. I recall that he was always helpful in doing what he could for you at his shop if you were not too well off!